Hi Everybody! Happy Weak End!! On a positive note, it is time to reveal the cards those of us sent and received who partysipated in Deborah Nolan's (Society of Stampaholics) July Card Chain Challenge. I used the Lil Inker stitched rectangle on the card base and the stitched oval for the peek-a-boo opening. The paper behind the opening and the stapled ribbons are by SU. The NBUS sediment is from Kaiser Craft's "Friendship Sentiments" set. QACAS! I followed the friendship theme and sketch option below. Next to it is the beautiful card I was fortunate to receive from the talented Marga from Spain, whose blog is My Crafty Inspiration. It would be lovely if you could visit Marga! 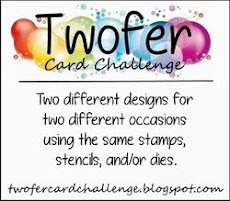 I think Deborah's challenge is really a fun way to send Happy Mail all over the world and make new card pen pals, so I hope you'll check it out and join in! My second card today is a twofer inside a twofer, so to speak, because 1) I made another Christmas card, and 2), I squeezed in a DJKASE for July! The striped fishtail banner is from MFT. The scallop frame is cut from felt using a NBUS Nestabilities die called "Lacey Squares." The wee reindeer is from Paper Smooches "Santa Paws" set. And the NBUS "Joy" is from Winnie & Walter. 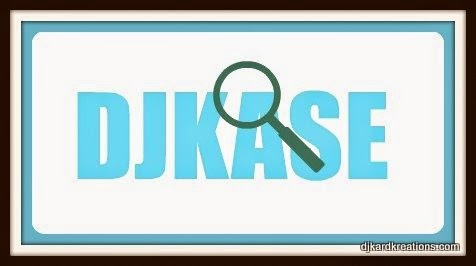 And who is my DJKASE inspiration? I'm delighted to say my honoree is my friend Jane Willis of Onions and Paper. Jane's blog name refers to the fact that she provides us with mouthwatering recipes for food in addition to her outstanding recipes for cards! Of course, me and the hamster are all over that combo plate! Here is Jane's May Rudolph Day card which I pretty much COPIed. I just fell in love with this adorable card! I took some liberties with the layout, but the focus pocus is pretty much the same. I loved the pop of stripe on Jane's card, so I used a striped pp for my fish-tail banner. After the blizzard fiasco in my last post, I know Jane will forgive me for not drawing faux snowflakes around and about my reindeer! Simply Create Too: Anything Goes. Freshly Made Sketches. You might think I used the same Deborah CCC sketch as the first card above, but in the ironical ways of Blogland, check out the current FMS sketch! You are responsible for confirming this notice actually works for your blog and that it displays. If you employ other cookies, for example by adding third party features, this notice may not work for you. 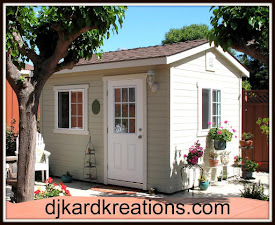 Learn more about this notice and your responsibilities." If I understand it correctly, it's now the law of the land in Europe and Google makes it sound pretty dire if you don't have the banner on your site, so I'm leaving it alone. I can also assure you that I don't advertise for anybody nor knowingly provide your information to anyone. But I mean, aren't cookies just a necessary evil both in the Land of Interwebs and as they relate to waistline spread? 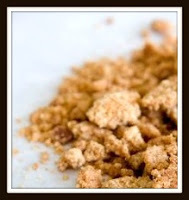 We just involuntarily leave our crumbs behind, don't we? I mean, when any of us from any country clicks around the Webs, don't we know that you know that I know that they know that you know that I know that they know where we've been, right? You know what I'm sayin'? Speaking of cookies, I went out to a belated birthday lunch with my friend Donna a couple of days ago. (Yes, that's right, I celebrate all month. Can I get an Amen?) I ate a very healthy lunch, but as I was leaving, I saw something in the Temptation Counter than melted all my resolve to be a good girl. I'm a sucker for a cinnamon roll and this beauty was the Mother of all Cinnamon Rolls! I hope Europe doesn't have a law against publishing photos of cinnamon rolls! Oops. Now I've done it. Wow, I've been DJKASE'd! Really delighted to have inspired you to make such a fab card - and I'm relived that you didn't let Hammy loose with that snow. poor Rudolph would have drowned in it. And drowning is pretty much what you would do if you dived head first into that cinnamon roll. Sketches and CASEs are my favorite challenges as I'm always amazed by how many different versions that can come out from the same source of inspiration. Your first card has a great textured feel to it with the banners, and I also like how you cut out the oval and added it a bit off the centre. Your Rudolph card is so fun. You do make many fun Christmas cards. Here I love his eyes and the CAS layout in combo with lots of colors. These cards are amazing! 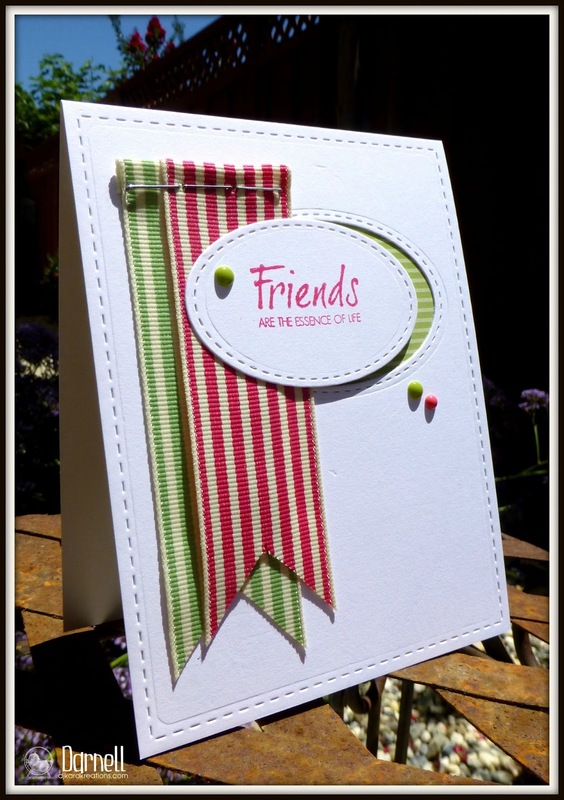 The friend card is simply stunning and what a great idea - I have a stash of ribbon that is just looking for somewhere to go! I wondered why I keep seeing the grey bar along the top of blogs. Wow that has got to be the biggest cinnamon scroll I have ever seen. Hope you ate every itty bitty bit. Love your cards, all beautiful. Funny you talk about cookies, it means nothing other than a computer term here cause we say biscuits. Same as we say bread roll for what you call sandwiches, and scones for what you call biscuit. History lesson finished. Always love my visit. What a whopper! Cinnamon roll that is. These pesky banners are really annoying me too, do we all have to be treated like two year olds? Oh my .... what a whopper!!!! Looks delicious! I've had the banner on my blog too ........ not sure I understand it all but, I'm leaving well alone. Those banners are soooo annoying - the law has been there for several years now and nobody's died from lack of a banner, so why do we need to have them now? They seem to be on every Blogger blog. We're grown ups and we all know about cookies, and if we didn't like them we wouldn't use t'interwebs. Maybe we all just need one that comes up when we switch on our computer for the very first time that we have to click to say we accept them before we can start surfing, and then after that it's all over and done with. Plus there doesn't seem to be an option for chocolate chip flavour. Darnell, I just love reading your post every morning!! I just have to remember not to be drinking hot coffee when I do. Awesome cards!! Firstly your cards are fabulous!! Love both of them and the one you CASed is gorgeous! Have a lovely weekend and just so you know I make buns too ... filled with sultanas covered in lemon icing and they are delicious but so more....ish I tossed the scales! The new cookie thing totally CONFUSES me ... so I just let it be! LOL!! I love love love your cards!! LOVING that adorable reindeer!!!!! Very creative offsetting that oval. I may just case that!! Your little reindeer is adorable. And what an attitude with the different size eyes. Looks like he had a little too much fun celebrating. Last things first, that cinnamon roll looks absolutely scrumptious! I have a thing for cinnamon rolls, too and I'd have bought and scarfed it down sooo fast! Yum! Your cards are terrific. Adore the mismatched googly eyes and the whole design of the second card. It's so full of fun. :) And your friend card is simply beautiful. Great work. I hope all the fires I keep hearing about in CA are not anywhere near you! Hugs! I always know I will leave your blog smiling! I enjoy reading your posts as much as I love seeing your great creations! And today I am leaving wishing for a cinnamon bun! Lovely cards Darnell and I particularly love the Christmas version! Your wonky eyed deer is sooooo cute and I love your CASE of Jane's card. Girl, you could get into so much trouble with the Google folks across the pond. Cheeky is something they really don't understand. Back to why I'm here. First, I subscribe...secondly, congratulations on your Altenew win (yay! for you)...thirdly, it's good to see you're still knocking these cards out of the proverbial park. Love the use of the ribbon on that first card. WOW! The reindeer actually looked like he ate some loco weed, but he's a terrific KASE. Another thing we share, oddly enough, is our lack of resistance to cinnamon rolls. I actually dream about my mother's but, even she, could not have created the masterpiece you've shown her. Double YUM! I love both your cards, especially how you offset the ovals in the first one. (Call me weird, but that little indention doesn't bother me, it just looks like another embossed effect). That's one yummy looking cinnamon roll. Fab selection of cards Darnell! I love the layout on the first one and the ribbon is gorgeous! Rudolph is so cute too. Your posts always make me laugh but I'd be scared if someone plonked that cinnamon roll in front of me!!!! Your cards are awesome! Love the cute reindeer with the googly eyes. Poor thing! Love the banners on both. Neat how you lined up the staples! Posting that cinnamon roll was a mean thing to do when I'm on a (South Beach) diet! That made me drool! Seems to be more of a see food diet! Fabulous cards Darnell. I love the design and colours on your first card and the cute reindeer with his wonky eyes really made me laugh. I am not surprised you couldn't resist that cinnamon roll, I bet it tasted as good as it looked! Benautiful both, Darnell! Love the colourful feel, so festive! My favourite is the first one, with these banners and the creative oval aperture! Well I have been wondering why the thing about cookies has been coming up on a lot of blog, now I know why, thanks Darnell, it's annoying me, I'll tell you. Great cards and a great post. My mouth is watering! What a wonderful looking cinnamon bun! Love your wonderful reindeer (glad the snow stopped). I'd like to think he's winking at me. And I love how you used the ribbons for banners on your friend card! Great idea! I'm ignoring all that cookie stuff. My Dr. said to stay away from such things so I have a good excuse if they come after me! I have seen the cookies crapola and I don't know or care about legal jargon - use plain English. On to other things I like the cards and the sketch is great, but more importantly "gimme that cinnamon roll." Was it as good as it looks? Often things look better than they really are. Your cards are fabulous. I love the big ribbons on the first one and the reindeer on your second card is just too cute. Your card for the CCC is very pretty and that cool dude Rudolph made me laugh! He is priceless! Congrats on winning over at Altenew! 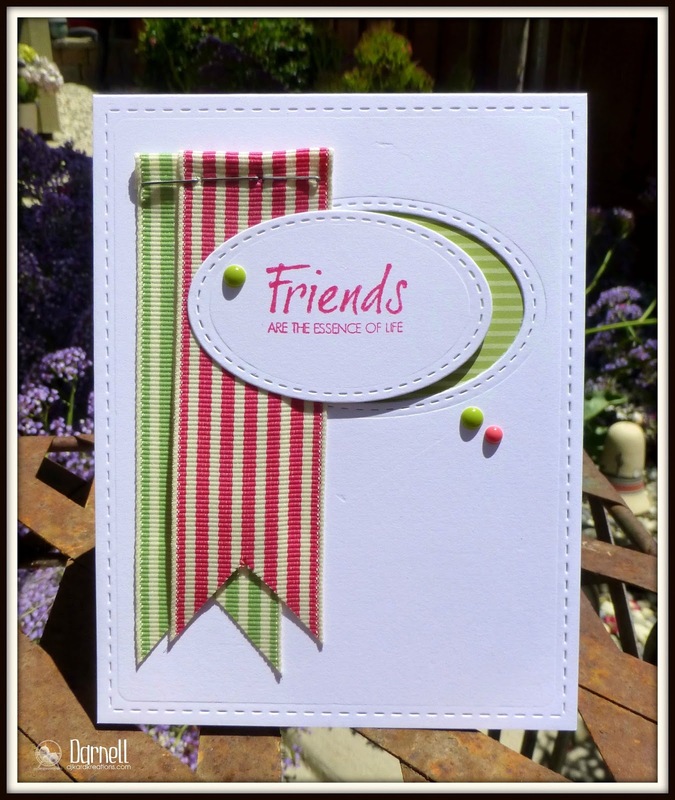 Love how you used the oval dies on your Muse card & the felt lacy square is wonderful! Great cards, Darnell! Forgot to say--I'm a cinnamon roll lover, too, & just your picture makes my mouth water! From CASEing to cinnamon buns and cookies - only you could link it altogether like that and leave me smiling AND drooling! My computer is in danger when you put up fabulous cards like these Darnell, never mind the food! Both of these cards are wonderful, Darnell! I especially like the ribbon on the first card. I need to use more ribbon! I've certainly got enough! That cinnamon roll looks delicious! I think I gained a pound just looking at the picture. It was worth it! LOL! Wow, an amazing twofer today Dippy. Absolutely love your first card and how you've offset the oval to show the stripped d/p behind. Gorgeous ribbon as well. Loving the googly eyes on that cute reindeer. I'm still speechless after seeing that massive cinnamon bun - think it's actually to feed four??????? You didn't..........no, you really didn't - did you????? Another round of fabulous cards Darnell! The reindeer are just too cute. I love how you slid the oval over a bit to show off the patterned paper behind! Thank you for your link to my blog, Darnell. What a funny reindeer card. I love his eyes. And the cinnamon roll.... ummmm!!! Such wonderful cards! Would love to dig into that cinnamon roll! I wish I had that roll right now as I'm making my rounds in blog land this morning!I'm even drooling I think. Your cards are all fun and Rudlophs eyes are quite adorable!Have a great Sunday! Love both your pretty cards and the adorable reindeer. Fabulous card Miss Darnell...I love your sweet and adorable reindeer! Just as cute as can be. And that cinnamon roll looks so amazing and paired with a pipping hot cup of coffee, oh so yummy! Oh my goodness - laughing out loud at your cookie comment. My waistline would know about them "IF" I let them in my house, the edible ones that is. Funny! Great cards! great cards Darnell, and as usual, I loved the conversation. I think both cards are joyful, as in "full of joy." 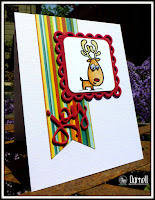 Love the happy colors and that odd-eyed reindeer image. Too fun! Fabulous cards Darnell - love them all! Re The cookie thingy, I just click on the "Got It" box and hey-ho the banner disappears! No idea what it's all about - I just carry on as usual!LOL! If my Blog explodes - tough! Darnell - Your CCC pal was super lucky to get your excellent card - I think I might be CASEing that card very soon - so awesome the way you made banners out of the ribbon and I love what you did with the ovals!! Just genius!!! And your Rudolph card - simply delightful in every way - even the uneven eyeballs!! JK - I love the cuteness of the card and I really like the way you designed and set up your card - looks so perfect for that FM sketch!! 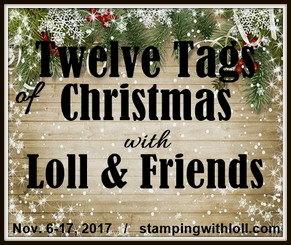 Headed over to check out if I still have time to play along!! Have a beautiful day and I hope this week finds you grinning!! I always love your cards but the first one is fab-u-lous!! Love how you offset the sentiment and the stitched look edge is just wonderful. Your rudolphs are pretty amazing too. Not that it will help in any way, I am sick and fed up of the 'crumb' banner, I even wrote to them but needless to say, I have had no response. I think the intention is to frighten us all into leaving it where it is, it certainly seems to be working! Love the twofer! Sweet sweet cards......and sweet sweet cinnamon bun! Yum! Ok, I was totally distracted by the cinnamon roll for a bit but these cards are fabulous! Love those reindeer! Glad you joined us at FMS! Playing catch up after vacation!! LOVE each and every project you created while I was away. That little reindeer is adorable and I am swooning over the birthday card with that super duper cute cake!! LOVE that card!! What fabulous cards, love how the ribbon banners are stapled clever idea. Fabulous cards, Darnell! That reindeer with the googlie eyes just cracks me up! Perfect Christmas card! Thanks so much for joining us at Freshly Made Sketches. 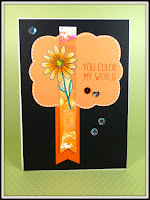 Wow - you've rolled out the ribbon and created one sa-weet card! 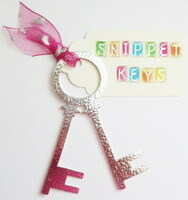 I love the offset oval (aka peek-a-boo) die sentiment 'banner'. I wish I wouldn't have given all my colored staples & stapler away! 2nd card...I speed read your post to find out what delectable piece of paper you used for the scalloped frame...and was delighted when I learned that you used felt - really, REALLY nice effect paired with Anita's paper! Sweet reindeer - love the 'was up' photo! Now I'm heading straight to our local bakery for a cinnamon bun! I'll eat it standing up so it will be 0 calories! Good thing I'm not making a card. There would be drool all over it from that huge cinnamon roll. Lucky that birthday treats have no calories. I simply love your oval friends card. The layout, the banner ribbons and the offset oval. The felt on the rudolf card really caught my eye. Perfect for a Christmas card. As for cookies, don't they know about chocolate chip? Surely they could have called them that. Then I wouldn't mind cookies so much. My keyboard is all wet. I need a napkin for my drool after seeing that yummy gooey cinnamon roll! Speaking of drooling, if you put googly eyes on an adorable reindeer, don't expect me not to try to steal that card. And I'm jealous of your CCC recipient. She is one lucky lady! I just have one question, did you eat the whole thing??????? Holy Cinnamon Roll! That is gianormous and looks so darn delish, I would not be able to resist either, Darnell! As you can tell, I got distracted from commenting on your cards, so I had to go back and re-look at 'em! Oh, my, how could I not LOL at the cookie story, Darnell!!! Hilarious!!! 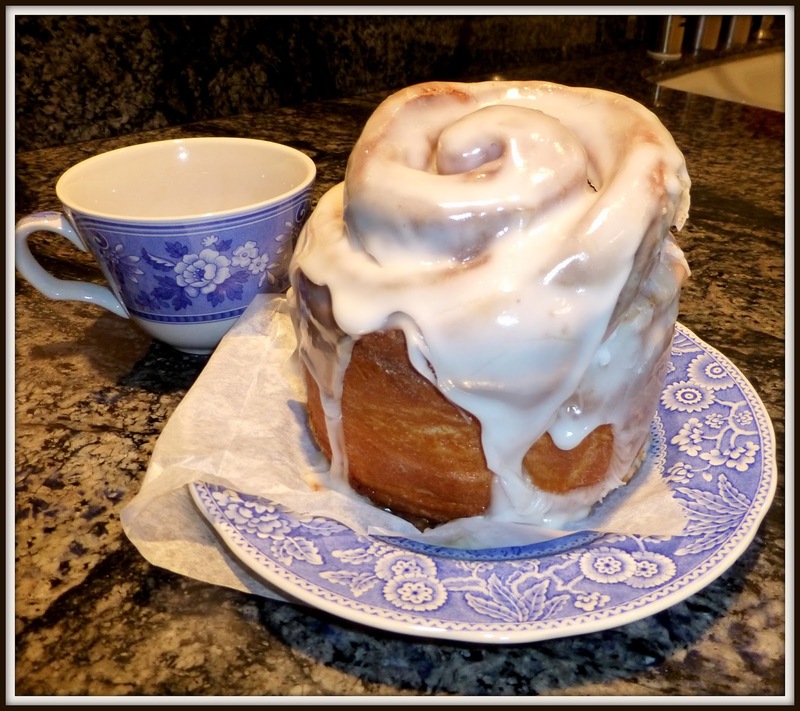 This blog of yours is such a treat - just as much as that gigantic yummy cinnabun must have been - good thing it's late here otherwise I would have been off to get one (somewhat smaller, here!!!)!!! 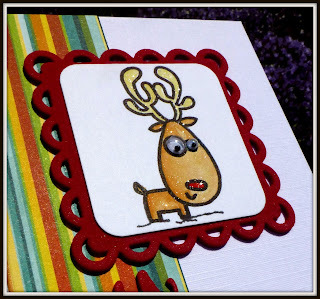 And you've made two lovely card ...love your stapled ribbons and the ovals on the first card and your reindeer is so cute, with his lidded eye and without the lid he is just so adorable!!! Love the beautiful stripes on both cards!!! Oh my oh my...from one ab exercise to another, without a chance for a breather! Your first reindeer...hahaahhahaha! Those eyeballs of varying size are hilarious, in only the cutest of ways! Fab card! Reindeer #2 - a darling case of Jane's card! The cinnamon roll...scrumptiously gi-normous! That alone is reason to convince my husband to travel your direction! I'll show this to him the minute he's back from being Chief Cycling hot shot at the Western Canada Games! Yummos! Such a cute card! 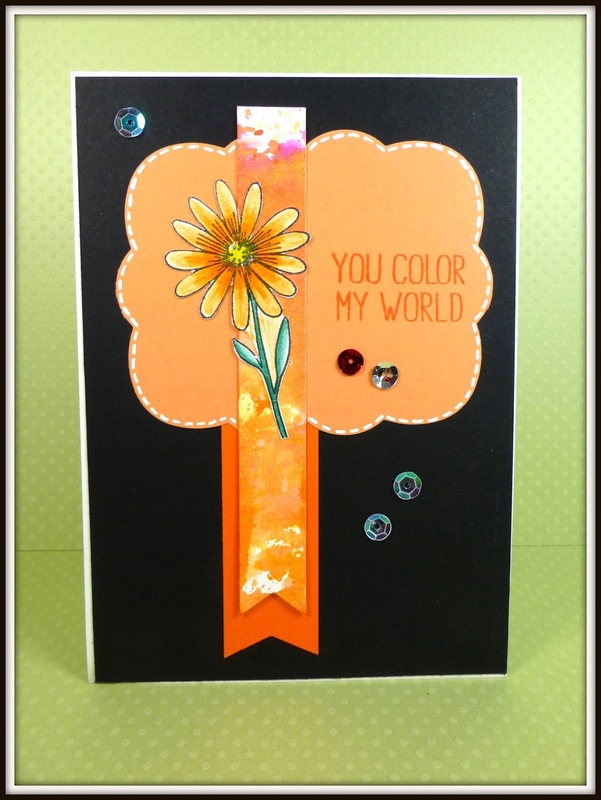 Thanks for joining the Simply Create Too challenge this month! and after looking at that Cinnamon roll...I think it also added another five pounds to my hips just from looking at it....smile!